I often hear authors say that, from a young age, they dreamed of being a writer. I am not one of those authors. In my adolescence, I dreamed of my skin clearing up and my hair feathering in the right direction. Okay, let’s be honest, I would have settled for it feathering in any direction. I was a constant reader, though, and I could often be found perched in the tree in my front yard in Houston, reclining in the branches with a book while keeping a vigilant eye out for Pierre, the neighbor’s foul-tempered shih tzu and known stealth-pooper. As an undergrad at Berkeley, I always had a novel in my backpack, but regularly clenched up at the assignment of an essay for class. (Dear God, what am I going to talk about for FIVE PAGES?!?) In a cruel twist, the papers expected in graduate school were even longer. But I kept reading. At some point in grad school, it became apparent that I was not going to be able to get by on bad skin and strangely bent hair alone; I needed a job. I gave this task the same strategic consideration that I had given my purchase of the purple corduroy knickers I seemed to be wearing in every damn photo from 11th grade. As a result, I regained consciousness a few years later to the chilling realization that I was well on my way to a career in public relations. Now, instead of essays and research papers, I was churning out press releases and ghost-writing magazine articles and op-ed pieces for local Los Angeles clients who were psychotically convinced that The Wall Street Journal was desperate to hear all about the grand opening of their new location in Valencia. Needless to say, these were troubling times, which I escaped in the break room at lunch by sticking my nose in a book while eating my microwave mac ’n cheese. As the years passed, I changed jobs and moved up, all the while wondering if I was the only one silently writing jokes during staff meetings and turning clients into characters who had much more interesting stories to tell in my head than they did in our conference room. I began to have a nagging, uncomfortable suspicion – which I made every effort to ignore – that I was perhaps in the wrong career. Of course, along the way, life was happening outside the office as well. By now, I was married and about to start a family. 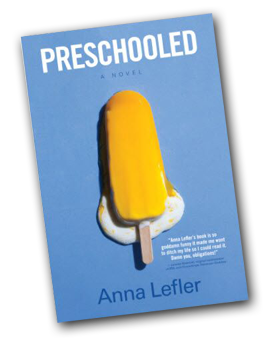 The arrangement was that I would stop working, start getting pregnant, and become a full-time mom. For those of you who don’t know this, the pregnancy deal includes a mandatory 9-month waiting period that, for someone who has crippling Type A tendencies and sleeps with a to-do list under her pillow, can be a little, um, challenging. Yes, I was creating an entire person, but what else did I have to show for all this time off? And what could I start doing that would ensure that, down the road, I would never accidentally end up in PR (or knickers) again? And so I kept reading…but I also began writing. Which I obviously had no business doing, but I did anyway. Which I’m starting to think is kind of the key to getting on the path you’re meant to find in life. (I’m sorry – can you guys still see me through this curtain of incense and wind chimes?) Anyway, it’s just a theory. Searching for a literary agent led to doing standup in various Los Angeles clubs. At the same time, I started a humor blog as an outlet for some of the shorter, surreal pieces I loved writing. The blog attracted invitations to speak at conferences like BlogHer and Blissdom, where I met a whole new world of cool, creative people – people who both changed the direction of my new career and became dear friends. 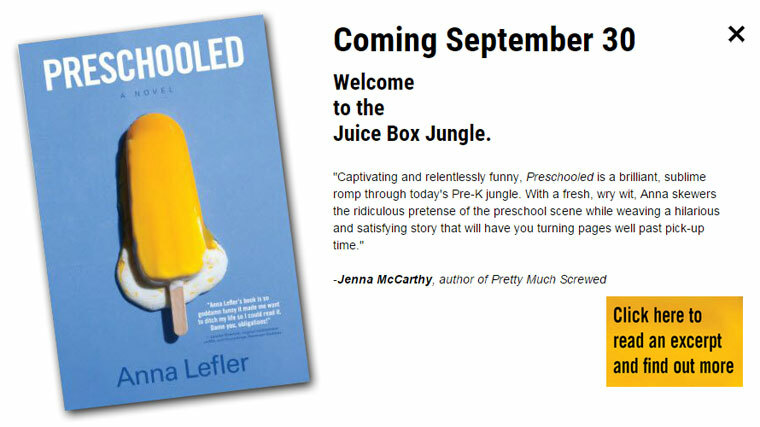 In 2011, a piece that I wrote for a women’s humor site led to my first book deal, and The Chicktionary was released later that year. That project led to my becoming a faculty member of the Erma Bombeck Writers’ Workshop, a particularly meaningful development for me, as I am a lifelong fan of Mrs. Bombeck’s groundbreaking work. Around that same time, my pieces began showing up online at places like McSweeney’s, Salon, and The Big Jewel. 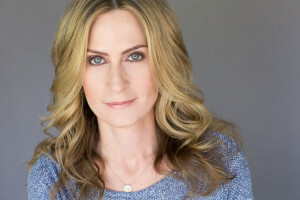 In 2012, I was given the opportunity to be a part of the Nickelodeon/NickMom television show “Parental Discretion with Stefanie Wilder-Taylor,” as both a recurring performer (Seasons 1 and 2) and a staff writer (Season 2). This wonderful experience opened the door to other comedy-writing opportunities for television and beyond – an area that I’m excited to have entered and continue to explore through new, ongoing projects. 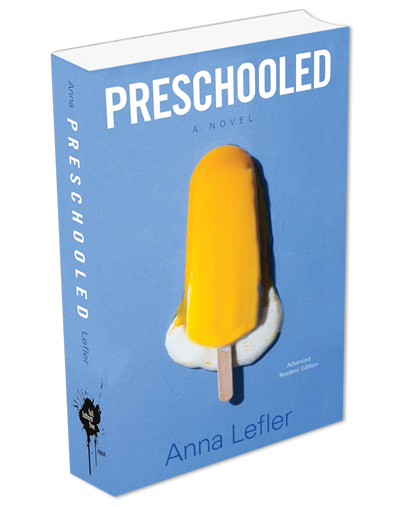 The publication of Preschooled brings me full circle – back to the world of novels – and represents the fruition of a transformative process that started in a mini-mall coffee shop with a pencil, a spiral notebook, and the first of several thousand zucchini-walnut muffins. I’ve often heard the expression, “Things happen when you’re ready.” I find that comforting because it makes me think that no matter where our lives take us, they’re taking us where we’re supposed to go and, eventually, we end up where we belong. Whether I’m ready or not, I’ve still got a book in my bag, and I’m just happy to be here.